Sophomore Lily Zeng warms up her violin before her audition. Just like an athlete might, musicians must prepare their muscles prior to performances. After preparing and practicing their music for weeks, orchestra students from across West Tennessee gathered at Briarcrest Christian school on Nov. 17 to audition for the selective All West orchestra. Nerves and energy were high, as now all that stood between the musicians and a seat in the orchestra was a judge behind a screen. Every year most members of the orchestra classes at White Station participate in this audition, often with great success. With an audition composed of pieces of music, scales and sight reading, preparation is key. Sophomore cellist Autumn Bobo has auditioned yearly since the seventh grade, so she believes her methods to be tried and true. Another issue many auditionees faces is nerves on the big day. A shaking hand can tank an audition, no matter how much preparation was put into it. Violinist Lily Zeng (10) finds that experience can help calm jitters. At the end of the day, the orchestra All West auditions help young musicians gain more experience and learn about how they practice best. 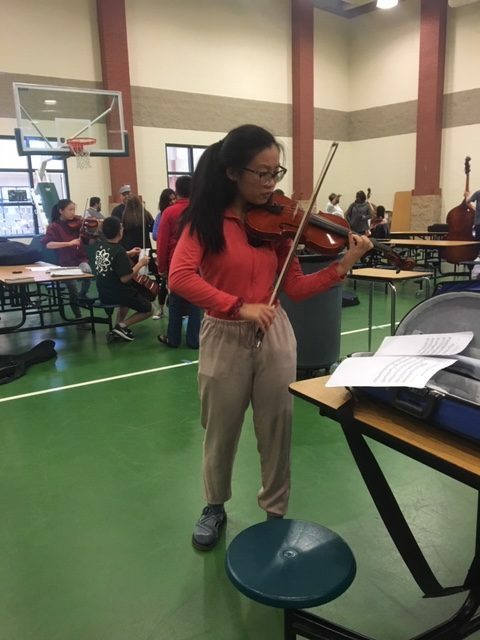 Zeng made ninth chair in the first violin section, an accomplishment that will allow her to participate in the All West clinic and performance in February. Bobo, however, made fourth alternate for the cello section, a setback that she looks upon as opportunity for growth. “This is my first audition I’ve taken that I haven’t actually made, so for me it’s a reminder that I’m not the perfect human or oblivious to making mistakes in audition rooms,” Bobo said.